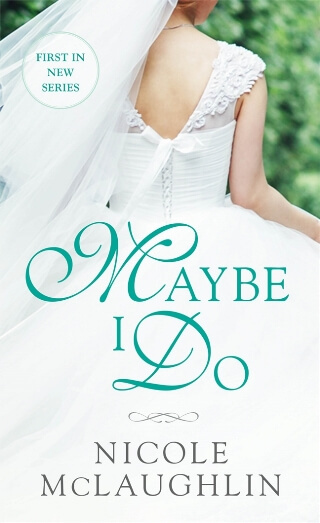 Wedding-themed stories can be a hit or miss, but MAYBE I DO was an enjoyable start to Ms. McLaughlin’s new series and I’m interested in what she has in store for us next. This story had a few surprises for me but I really enjoyed it, maybe because of those surprises. It was cute, fun and sometimes emotional, but very entertaining. Charlotte Linley may have a successful career as a wedding photographer but she certainly has no illusions about weddings, having been left standing at the altar. One upside to her gig is spending time with the trio at her favorite wedding venue especially the gorgeous Dean Troyer; and while flirting with him may be fun, Charlotte is not looking for a relationship. Dean has his own scars from his attempt at a happy ever after and is not looking to take another go at it, but he lives for the days he sees Charlotte and when he’s drafted to plan his sister’s wedding, she’s the only one he can think to ask for help from. Every moment spent together makes their feelings for each other even more powerful, but can two people with such baggage as theirs open up to love again with all the risks it comes with? I liked the characters a lot. Dean was an older guy and surprisingly was reserved, quiet and quite insecure (with reason), not the confident alpha male you’d expect. Charlotte was more mature in the way she carried herself and managed her business and life than you would expect for her age. She was confident, smart and knew what she wanted. Both of them had a lot to deal with in order to make their relationship succeed and Dean struggled with a lot more. The pairing of a stronger younger woman and the slightly insecure older man was unexpected but totally worked for me. My least favorite thing about this story is the exes that just won’t go away. It added a layer of drama that was unnecessary in my opinion, especially since Dean and Charlotte already had their own hang-ups to deal with. I definitely will recommend this book to anyone who wants an enjoyable romance to end the summer.